China’s railway line to Laos is almost half complete, putting it on schedule to begin service in December 2021, said the chief of Lao Railways. A Chinese railway engineering company on Thursday drilled through Boten Tunnel, the first major tunnel over 5,000 meters along the China-Laos railway. The Japanese government has offered US $1.8 million in grant aid funding for aquaculture-related projects in Lao. People can now easily pay land tax to the Banque Pour Le Commerce Exterieur Lao Public (BCEL) and its counter services across the country as the Tax Department under the Ministry of Finance has allowed them to use only land. Buyers from the Chinese province of Sichuan are expected to import up to 50 tons of fruit from Laos each year including bananas, pineapples and passion fruit. The Lao government officials and development partners are meeting here to discuss the efforts Laos needs to take to graduate from the Least Developed Country (LDC) status. Combat engineers from Russia’s International Mine Action Center have received government awards for clearing Laos of unexploded US ordnance and air bombs left from the period of the war in Vietnam. The Japanese government has provided grant assistance worth USD 22,195 to Vientiane Rescue 1623, through its Grant Assistance for Grassroots Human Security Projects (GGP). Like wildlife in biological hotspots worldwide, Laos’ wild and domesticated elephants alike are facing a time of rapid and significant change, amid increased man-made developments and a fast-changing natural and socio-economic environment, Laotian Times writes. The government yesterday advised the public not to be alarmed about African swine fever, which cannot be passed to humans, after reported outbreaks in other nations. Laos, Thailand have promoted cross-cultural craft to strengthen cooperation between skilled sculptors of Laos and Thailand. This research service provides information about the industrial automation and process control market in the growing countries of Laos, Cambodia, and Myanmar. 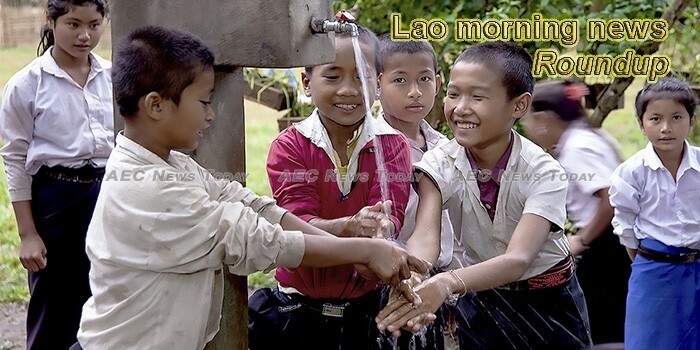 Minister of Foreign Affairs of the Lao PDR, Mr Saleumxay Kommasith has congratulated Mekong-Lancang Cooperation member countries on marking their 3rd Anniversary of Establishment (March 23, 2016 – March 23, 2019). Health experts joined representatives from newspapers, radio and television in Vientiane yesterday to discuss the reporting of official information in the fight against measles-rubella and other diseases. The first International Lantern Festival will be held at agro-tourism Phoutaven Farm in Pak Ngum district, Vientiane Capital on Mar 7-10. Jinping County in Yunnan was surprised by hailstorms on the morning of March 19th, 2019. The National University of Laos’ (NUOL) Faculty of Engineering has announced it will hold its 15th National Robot Design Contest in March next year. Toyota Motor Thailand has awarded prizes to the winners of the Toyota Dream Car Art Contest 2019, the twelfth of its kind. The Enhancing People’s Participation through Community Radio (EPPCR) project is enhancing community participation in eight radio stations by providing skill development and training in radio production to public officials and volunteers. A new rest area for motorists in Xeno, Savannakhet province has opened for public service this week after completion of the project. Farmers of Hom and Simmano villages in Hadxaifong district of Vientiane will reduce the use of chemicals in farming processes after joining a training programme that increased awareness about chemicals and the need for sustainable development. One of Louisiana’s most culturally unique assets that draws crowds by the thousands each year — The 2019 Louisiana Lao New Year Festival on April 20th same weekend as Easter.